Free White Paper: "Legal Use of Drones in the Real Estate Market"
It’s now lawful to use drones for real estate photography ONLY IF you are flying under a Section 333 exemption from the FAA and you obey all other FAR/ AIM regulations. 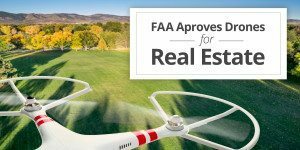 There are many reasons why real estate brokers and agents should consider obtaining their own Section 333 exemption from the FAA. Competing brokers are already flying (many illegally). Home sellers expect photos that only drones can take. Relying on outside vendors is costly and unnecessary. Enjoy ROI with your own FAA Section 333 exemption. The use of drones by real estate professionals is not going away. Approximately 20% of the petitions for Section 333 exemptions concern a real estate use. The FAA with has already granted over 1,200 petitions for exemption approximately 350 more petitions being filed each week. Real estate professional need to understand the rules before they fly, or even before hiring someone to fly on their behalf. This whitepaper is designed to introduce drones and FAA regulations to real estate professionals in an easy understandable way. While there are still many unknowns, the FAA has created a framework for real estate photographers to fly legally and safely under the 333-exemption process. Fill our the form below and dronelaw.pro will send you the leading white paper on the use of drones by real estate agents, brokers and photographers. This white paper will tell you what you need to know about the current state of FAA drone regulations and how it is impacting real estate photography and videography. There is no risk and no cost to you.